My fellow Photofocus author Michèle Grenier has been writing about her experience of deciding to switch to mirrorless. During this time my trusty old Canon 6D decided it needed a break so the LCD screen stopped working. I thought I’d offer another take on the mirrorless vs. DSLR debate. Let me preface this by saying I am not a tech head/gear hound. I do not get all excited about the newest, latest and greatest cameras and/or gear. Not to say I don’t watch and pay attention to what’s out there, but I’ve never been one to go out and upgrade gear just because something is touted as bigger, better, faster, etc. If it works for me, I’m happy to use it until it dies. I only switched from film when my husband bought me the Canon T1i for my birthday back in 2009 when it first came out. If he hadn’t done that I’d likely still be shooting film. Luckily I have a Canon repair facility 20 minutes from my house so I took my 6D and dropped it off to get an estimate. My first thought is just to have it repaired and get on with my photography. The estimate is around $300 to replace the LCD screen. This made me reconsider repairing it. It is entirely possible that it will come back that they find more than just the LCD screen wrong with it. That means the estimate will increase. What to do. There are far too many options that for sure I know is true. Hi everyone — answers/opinions wanted. I have a choice at the moment to spend $300 (minimum if they don’t find anything else) to fix my Canon 6D — 82,957 actuations (100,000 lifetime supposedly) OR … I take that $300 and put toward a new one. My initial thoughts were to just get another 6D right now as they aren’t that expensive with the new Mark II out. Then someone suggested checking out the Canon EOS R — I heard some of you have a little experience with this. Might be a bit more than I was thinking of spending but if I’m going to buy something now I may as well look into it. That lead me down the Canon EOS R rabbit hole. I even had one in my cart for a while. Then others chimed in with their preferred brand Fuji, Lumix, Olympus, Sony, etc. Yeah, way too many options and that just made me want to get on with getting my 6D fixed and being done. Then I decided that I would rent the Canon EOS R for a couple of days before I decided anything. Good idea, but that also adds cost to the process and sets me off thinking again. Notice I said NEED, not WANT. Yes, I’m practical. It’s a question I ask my photographer friends often when they start talking about buying new gear. Do you NEED that? What will it do for your photography? Remember, the gear does not make you a better photographer, YOU make you a better photographer. Yes, of course (before you start arguing) upgrades can help with better resolution, faster frames per second and such things, but will it make you more money? Will you sell more? GAS (gear acquisition syndrome) is real, I know people who have it. We all do. While researching options, I also found that the Canon 6D is on sale at B&H right now — $999. It’s a great deal. It’s in my cart also. I decided to have the 6D repaired, first of all, unless the repair comes back at much more than the initial estimate. If that happens, I’m buying a new Canon 6D. Why? I love my 6D. It works well for me, I’m used to it (we don’t like change, do we? ), it does what I need it to do for the work I produce right now and it’s a great deal. What this also allows me is time. Time to rent other options at my own pace and not having to worry about not having a camera for a workshop I’m teaching next weekend. Time to explore more options, time for technology to take its course. Wait and see what Canon does next after the initial foray into mirrorless with the Canon EOS R.
I would suggest checking out Michèle’s articles, they are a great window into doing your research and finding out what works for you. In the end, it’s all very personal. What works for you may not work for me. It can come down to how the camera feels in your hands, or the technical aspects. Do your homework. Go to a camera store, try them out, rent them, research, ask your photography friends. Just because you can upgrade doesn’t always mean you should. P.S. 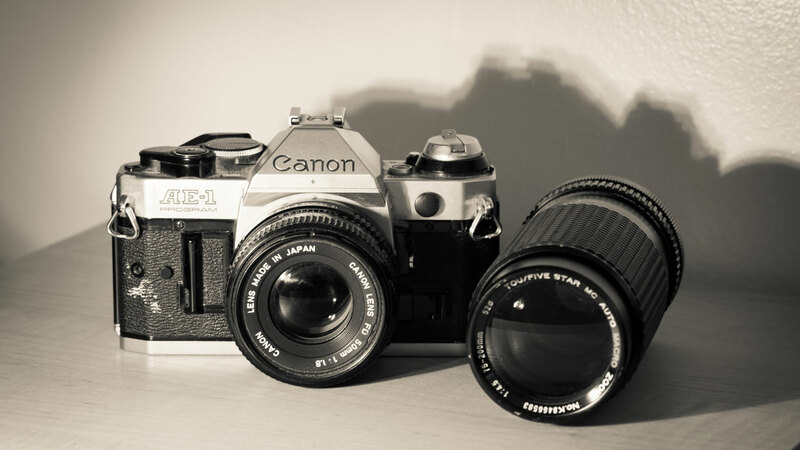 The lead photo is my old reliable Canon AE-1 that I still shoot with. AE-1 nostalgia: I believe the AE-1 was one of the first SLRs to provide a finger grip on the camera body in the form of the battery door.